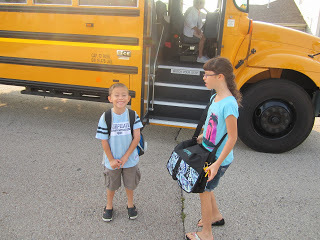 School’s back in session! Yay! But, this also means dealing with things like school lunches, school parties, school snacks, the occasional unsupportive teacher, and the like. Thus marks the beginning of e-mails to the teachers. I just wrote one for my 5 year old who just started all day Kindergarten. At this age, it’s important that the teachers know what kinds of things should and should not be going into their mouths or on to the skin. Lucky for me, this year, our public school decided to ban all birthday treats! Hip, hip, hooray! So, I spent the month of August stocking my freezer for birthday treats, only to find out they no longer do them. Oh well. They’ll still get eaten. But, when we did have to do birthday treats, I’d ask the teacher for a copy of all the birthdays so that I could send in a treat with them on that day. Usually a frosted muffin or a big frosted sugar cookie. Some teachers were really good about getting that info to me and some were not. If they have the birthdays listed on a bulletin board in the classroom, I just go in and write them down each month. Or I’ve had teachers who wanted to e-mail them to me once a month, but would often forget so I’d have to e-mail them and ask each month. I know it’s kind of a pain for them, but I don’t think it’s asking too much so that a kid can celebrate a birthday along with the rest of the class. Our kids didn’t ask to have food allergies or for companies to add chemicals to their food that make it hard for them to concentrate and behave in school. I also would leave a few frozen muffins or cookies in the front office freezer in case their was a birthday that I missed or someone brought in a treat unexpectedly, like donuts. My daughter would go down to the office and pick it up. Last year, her class was way down at the end of the hall so I didn’t want her to have to walk all that way and miss the whole treat time. So, I left a box of cookies with the teacher instead. She brought Enjoy Life’s Snickerdoodles (stage 2). I also left a bag of lemon balls (Stage 1 – I order online from Giambri Candy). 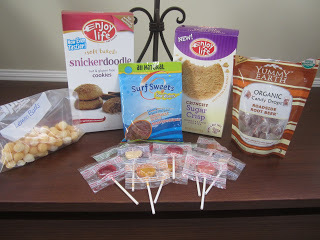 This year, she took Enjoy Life’s Sugar Cookies since the teacher said she occasionally brings in a treat for the kids. When my oldest son was younger, he took Surf Sweets Gummy Worms and Yummy Earth suckers as his candy (both stage 2), and candy canes for around Christmas time (from Whole Foods). The teacher lets me know when her stockpile of candy is getting low. In the Christian schools, I’ve noticed they do candy MUCH more than in the public schools. Why I don’t know. They did a series called “Get Healthy” at our church (which is linked to the school) for a while and I couldn’t keep my silence any more. I had to send a letter to the principal telling them how unhealthy it is to keep throwing candy at our kids and having treats once a week for everything under the sun. But, it was to no avail. Oh well. I’m almost positive one day the government is going to ban all school treats across the nation. Too many kids are overweight and unhealthy and we wonder why. What happens when we get them a haircut? Would you like a sucker? Go to the bank? Sucker? Go to the doctor? Sucker? Go to school? Birthdays about every week or two, followed by the kid’s birthday party. Our kids eat so much sugar and junk, it’s ridiculous. So, normally in my beginning of the year letter to the teacher, I’d include something about birthday treats, but I didn’t have to this year. I also talk to the teachers on the first day, but I follow it up with a letter because I’m sure they don’t remember everything from that first day after talking to so many parents, and I want to make sure I get it in writing. It’s also important that the information be passed along to any other specials teachers that might give out candy. This way the teacher can just forward the e-mail to whoever needs to be aware. Below is a copy of the letter I sent for my Kindergartener. When we first started Feingold, my letter was longer and more elaborate. For some reason, I thought that the teachers might be really interested in learning about Feingold and how it could potentially help some of their students. Wrong. They don’t care. At least that’s been my experience in the last 8 years, putting three kids through school. Sadly, they are often defensive and don’t want to believe that a simple change in diet could change a child’s behavior. The teachers I have dealt with (in the public school system) are more suppportive of meds to treat ADHD. So, anyways, instead of using my letter as a means to educate teachers, I keep it sweet and simple. Here’s what you need to keep away from my child. 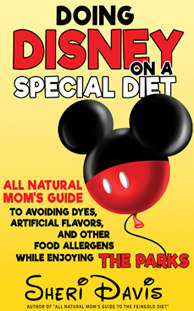 If you want to refer to your child’s issues with dyes and the like as allergies, go for it. In my opinion, an allergy is anything if ingested or exposed to causes a reaction. Well, if my kid eats red dyes, he’s going to react. Therefore, it’s an allergy in my book. Schools respond much better to the word allergy than they do to a family’s lifestyle choice for health reasons. I’ve not had to deal with that too much. I just tell the schools that I will be providing all of my kids’ food and treats. It’s more of an issue at the preschool and Kindergarten age where your child may not speak up for themselves and be given something they shouldn’t have. As my kids have gotten older, they’ve taken more responsibilities for their food choices and know how to decline food or treats. My younger kids also have food allergies on top of doing the Feingold Diet. Once my kids get to about 3rd or 4th grade, I don’t send in letters anymore but I do still talk to the teachers. We did have one incident when my son was in first year preschool where a parent helper gave my son a cupcake which had eggs, gluten, and who knows what else. He of course was thrilled that it was sitting in front of him and quickly started eating it. It wasn’t until a friend of mine who was there noticed and questioned the teacher about it, that she took it away from him. What bothers me though is that she did not even tell me about the incident. My son could have a reaction. I found out about it a couple weeks later from my friend. I had already talked to the teacher in the beginning of the year about not letting him eat anything that wasn’t brought in from home, and I had written on his registration forms about his seizures and food allergies. I gave birth to my fourth child the first day my son started preschool so I hadn’t sent in a letter to the teacher like I normally did. Now I know to always send in a letter along with talking to the teachers. Here’s the letter I just sent for Kindergarten. I forgot to add that my son should not be allowed to share food with other kids at lunch, and will never be getting hot lunch. He usually doesn’t, but this is our first year of him eating lunch on his own away from home. I also contact the room mom or teacher ahead of time regarding parties to find out what they are providing for treats and then I send in something similar for my kids. getting sick with high fevers. 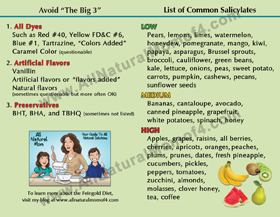 fruits that are high in salycilates. contain gluten so any stickers should go on his clothes and not his hands. specials teachers that might be giving out candy in their classrooms. And, if you homeschool, well, you already know that this is just one more reason why you are glad you homeschool. You don’t have to deal with all this! Update: Now, on the first day of school, I give my kids’ teachers either a copy of my book or one of my magnets, or both. I think it helps them remember my child and that they need to only be eating food brought in from home. I’m sure it’s getting harder and harder for teachers to remember which child has which food allergy. To order a magnet for your kids’ teachers, go here. 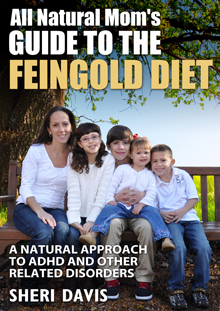 For more information on the Feingold Diet, check out my book, “All Natural Mom’s Guide to the Feingold Diet” available on Amazon. 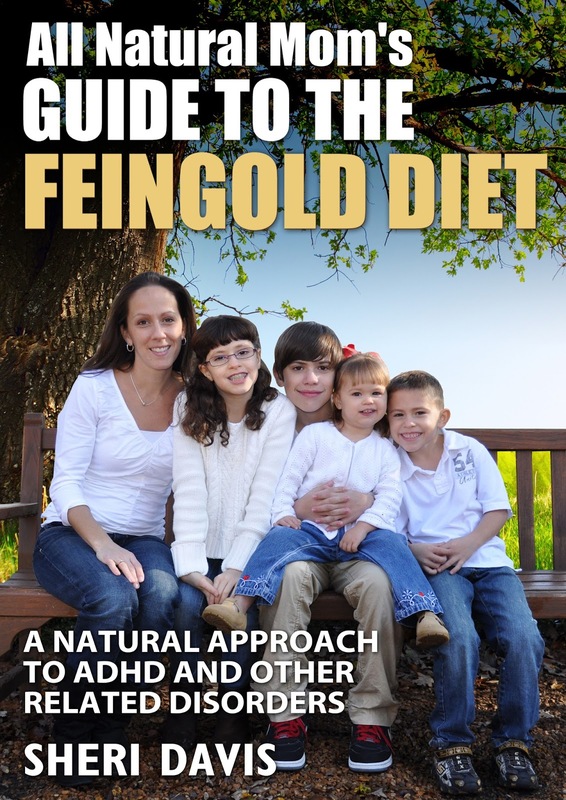 I know this is an old post but I have just started researching the Feingold Diet for my son Blaze. He has Asperger's and ADHD and is on a low dose of Ritalin (which we haven't had any issues with thankfully) and Tenex to sleep at night because autistic children usually have sleep issues. I stopped the Tenex because of side effects and went to a low dose of Melatonin which works much better for him. Although if there is a way to treat him without meds I am all for it! 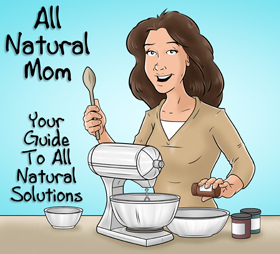 We already try to eat more naturally but this stuff is in everything! Do you have any ideas or suggestions for beginners?? Please email me at mommy2blaze at gmail dot com if you have time. Thank you. Hi Sheri, I have a 10 year old son who is challenged with ADHD, mild motor tics and anxiety. he is afraid of the dark thus resulting in him not sleeping by himself. I recently purchased the FG Diet and it is completely overwhelming to me. This wk'end I tried to grocery shop and spent over $400. and still don't know what to cook for him. Can you please give me some pointers as well on how to get this going smoothly. My email is jackiemathis44@gmail.com. Thanks!! Hi Jackie. Everyone who starts the diet is overwhelmed at first! I was too! Don't worry. It gets easier. I will email you some time this week. Sheri can you please email me – I am very overwhelmed!! On all of it – like snacks for kids or breakfast, lunch and dinner – – – ahhhh!! !